The Finance Minister and head of the government's razor gang Lindsay Tanner has warned of “pain” and “hard decisions” in the May budget, saying that some of its spending cuts will be politically controversial. His warning comes as new figures show that private borrowing grew its fastest rate in 19 years in the year to December climbing 16.5 per cent - more than at any tine since the eve of the 1990’s recession. The Federal Reserve cut US interest rates by a further 0.5 per cent on Thursday morning Australian time, taking the total cut over the last week to 1.25 per cent in a bid to stabilise the US economy. The Australian share market traded nervously closing up 0.56 per cent weighed down by news that the ratings agency Standard and Poor’s was considering downgrading a number of US banks and news that the Australian futures broker Tricom had been unable to settle its accounts when they fell due. Australia’s Reserve Bank is expected to lift interest rates at its board meeting next Tuesday unless concern about the stability of the financial system or the US economy forces it to stay its hand. Mr Tanner said yesterday that he expected to cop flak for his budget cuts, but they would be needed to stave off the prospect of still higher Australian interest rates. So far he had only exploratory talks about the cuts but the real “hack work” was about to begin and with the hard decisions taken in February and March. The achieve the government’s target of boosting the budget surplus to at least 1.5 per cent of GDP he would need to cut spending by $3 billion to $4 billion, perhaps more, on top of the cuts already announced. “That’s a big task, we’ve set the bar high, and there will be pain,” he said. In Opposition Mr Tanner outlined $10 billion of budget cuts including a 2 per cent increase in the public service efficiency dividend that would take it from 1.25 per cent to 3.25 per cent for one year only. Asked yesterday whether those cuts were the easy ones and the hard ones were to follow he replied that to some extent that was true. “Inevitably there were things that we identified in opposition that were less politically painful than may have been”. “But its also important to keep in mind that a major constraint in opposition is lack of information,” he said. Mr Tanner confirmed last week that the $22 billion budget for the Department of Defence would be exempt from razor gang cuts saying that during the election he had made a commitment to maintain the totality of defence spending and he would honour that commitment. The Reserve Bank Governor could "endorse in principle the idea of a fiscal stimulus and give Treasurer Wayne Swan the moral authority to run significant deficits for a period". It is unlikely that monetary policy can do the required job on its own. Economists in the United States are therefore urging the Bush Administration to back up monetary policy with changes to tax and spending policies. Federal Reserve chairman Ben Bernanke has now added his considerable voice to the others by supporting the idea of a fiscal stimulus because, he said, ''fiscal and monetary stimulus together may provide broader support for the economy than monetary policy actions alone''. Bernanke has also hinted at the kinds of stimuli that might be most appropriate. Money, he said, should be put in the hands of ''low and middle-income households that would spend it in the near term''. He is not worried about a temporary blow-out in the fiscal deficit and is hopeful that inflationary pressures will soon ease. This is a risky strategy, but in my view, the right one in the circumstances. What are the lessons for Australia? Australia is, of course, at a different phase of the business cycle from the US. But the world slowdown is bound to have an impact on our exports and the share market slump (which is much worse than in the US or Britain) is likely to shake business confidence and have a ''wealth effect'' on consumers. On top of that, concerns about inflation are so strong that we are bound to see a continuation of restrictive monetary and fiscal policies for some time. 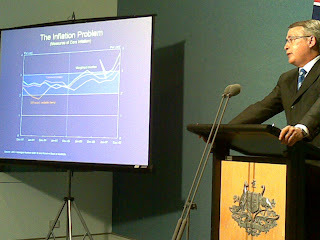 Reserve Bank of Australia governor Glenn Stevens has hinted that the ''equilibrium'' unemployment rate the jobless rate consistent with the RBA's underlying inflation target of 2 to 3 per cent on average may be higher than the current rate of 4.3 per cent and that Australians may need to accept a scaling-up of unemployment as part of the price for containing inflation. The implicit message is that monetary policy will remain tight for some time. Despite all this, we may still end up with a mild economic slowdown in 2008-09, with unemployment stabilising around 5 per cent. If so, it would help relieve the skills shortages and damp wage-price pressures and leave us in a stronger position. But we cannot rule out the possibility of a more severe economic slowdown one that threatens a rise in Australian unemployment to 6 per cent or 7 per cent. What should the authorities do then? The bank may switch gear and ease monetary policy but, for the same reasons as in the US, this might not be enough on its own to revive the economy. Monetary policy would need to be backed by fiscal policy. In such circumstances, how would the Rudd Government respond? Having staked its reputation on fiscal conservatism, it may be reluctant to inject a discretionary fiscal stimulus. However, the politics could be defused if Stevens decided to endorse in principle the idea of a fiscal stimulus and give Treasurer Wayne Swan the moral authority to run significant deficits for a period. In doing so, Labor would not be breaching its promise whichis to run surpluses ''on average over the course of the economic cycle''. If a fiscal stimulus were needed, it should be capable of quick implementation and fairly quick withdrawal when economic conditions changed. And it should aim to achieve longer-term economic and social benefits over and above short-term stabilisation. This suggests that as well as measures such as temporary tax credits, the Government could take the opportunity to rectify the neglect of infrastructure investment such as in education, health, low-cost housing, urban roads and freeways, public transport, ports, energy, rivers and water. Hopefully, by the time urgent action is needed, the Infrastructure Australia body will be in a position to recommend short-gestation infrastructure projects with high benefit-cost ratios that could be put immediately into action and help to relieve bottlenecks in the economy. If the authorities play their hands well, the Australian economy could come out a winner. If we get a mild slowdown it would simply reinforce the work of the Reserve Bank. If the slowdown threatened to be severe, it would give Australia a golden opportunity to fix up some of its infrastructure problems. I confess. I like them. They are better, more powerful than the (much-loved) squiggle. They make use of the power inherent in those three to-die-for letters. Nick Gruen has found this youtube video of Barack Obama's weekend victory speech in South Carolina. I saw it live on Sky News because I happened to be at work on Sunday afternoon. Tuesday Column: It's the Treasury, but not as we know it. This Rudd fellow is becoming harder to put in a box. On one hand he is an economic conservative. He has locked himself into days of talks with the head of the Treasury and the head of the Reserve Bank and he is keen to follow their advice. When the spending cuts that he has promised are delivered in May they are likely to be big. Kevin Rudd seems at home with the ‘hard heads’ in the Treasury and also the ‘soft hearts’ who want to fix Australia’s social problems. It’d be tempting to say that sooner or later he’ll have to choose between the two. The Department of the Treasury, once correctly thought of as being principally concerned with saving money and advancing GDP, has changed almost beyond recognition. Remarkably - and quietly - it’s done it during the life of the Coalition government. Its mission statement does not, as you might imagine, require it upfront to increase the nation’s GDP. Nor does it require it to save the government money. It’s new statement, adopted a few years back, instead simply requires it “to improve the wellbeing of the Australian people”. Which would be fairly meaningless if it stopped there. But it’s has gone much further. After years of tossing around ideas and paying particular attention to those of the Indian-born Nobel prize winning economist Amartya Sen the Treasury has published a five-point definition of wellbeing that reads most unlike anything ever to have come out of a Treasury in the past. The first point that it uses to define wellbeing doesn’t even mention GDP, or even anything material. It is this: “The opportunity and freedom that allows individuals to lead lives of real value to them”. It’s as if the 900-odd Treasury officers in the iconic building across the road from the National Library have downed their calculators and donned caftans. “Freedom” once wouldn’t have had any obvious spot on the Treasury’s agenda, let alone the pole position. But it is absolutely importaqnt to Sen. He believes that freedom is the real measure of the quality of a life, rather than wealth. Within weeks of his appointment as Treasury Secretary in 2001 Ken Henry was lecturing business economists about Sen’s insights. In 2004 he published a closely-worded guide to the Treasury’s five-point definition that quoted Sen arguing that freedom was important in its own right, beyond its impact on happiness. The popular press and bookstores are just catching on to happiness. They are talking as if it’s the next big thing in economics. Dr Henry, the Treasury and Sen are looking beyond way it. The Treasury and Sen insist that freedom has to be real and practical rather than merely notional. In our context that means that indigenous Australians have to be actually able to find jobs rather than theoretically free to do so, something that Dr Henry has mentioned repeatedly in recent speeches. The second of the five points that The Treasury uses to define wellbeing is apparently more conventional. It is “the level of consumption possibilities available to the community over time”. In other words, people’s ability to get hold of the goods and services that they want and need. That sounds a bit like GDP. But the Treasury says it should be interpreted “in its broadest conceptual sense”. Things not measured in GDP are important too. Products such as breast-milk, services such as those provided by volunteers, as well as the environment and our ability to enjoy it. And it’s not enough that those things be available to the people who are here now. They have to also be available to future generations. The Treasury has produced two Intergenerational Reports. It has taken a leading role in the development of our emissions trading system. Its former Deputy Secretary now runs the new Department of Climate Change. The third point on the Treasury’s list relates to distribution. Long gone are the days when it only concerned itself with increasing the size of Australia’s economic cake rather than how it was divided up. How the cake is divided matters not only because it should, but also because it matters to human beings. That’s one of the most important findings from the relatively new field of behavioural economics. Experiment after experiment has found that an extra dollar is valued more by a poor person than by a rich person and that most of us care more about what we earn relative to other people than we do about the absolute amount we are paid. The Treasury quotes both findings with approval. It’s foUrth point relates to the level of risk in our lives. We shouldn’t have to bear more risk than we want to. Any government program that makes us more vulnerable to, say, the gyrations of the share market or the consequences of a firestorm is in part a program that has made us worse off. Point five relates to complexity, “the number of considerations, and the interconnections between those considerations” in our daily lives. Changes that make us financially better off but make our lives more complex do not necessarily improve our lives. The Treasury’s five-point definition is doubtless incomplete. It makes the point that the disciplines of “sociology, politics, theology and philosophy” have much to tell us about of wellbeing as well. But it’s a darn sight more complete a definition than anything that’s gone before. It empowers the department to fight homelessness just as much as it empowers it to fight inflation. Rudd has a soul mate in the Treasury. Perhaps without realizing it it’s been preparing for him for quite some time. > the level of complexity confronting Australians in making decisions about their lives. I will conclude with some remarks about the role of economists. Official and private sector forecasters on the one hand, and economic journalists on the other, interact to powerfully influence not just the day’s ‘news’, but more fundamentally the entire public perception of what economics is about. Virtually no reporting of an ABS release of data on anything economic would be printed, or broadcast on radio or television, without its including a few quotes from an economist. For this reason, even if the reporter manages to avoid introducing his or her own opinion into the story (a feat that most would appear to find altogether too challenging) all ‘news’ stories become, through the extensive use of verbatim quotes, little more than comment pieces of economists. It is often remarked that the Australian media is at the most sensationalist end of the international spectrum. In this, it appears to have found a willing accomplice in the economics profession. No doubt, sensationalism sells; if it didn’t, we would have much less of it. But I would ask you to ponder how much good it is doing to the reputation of the economics profession. 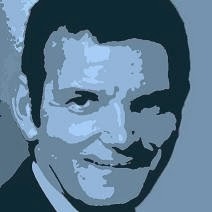 On that broader topic, of the reputation of economists, I cannot let this opportunity pass without saying something about economic rationalism. A thesis is emerging  that the reason economists are so out of touch with their detractors is that economists are interested only in the maximisation of material wealth, having no interest in the non-material consequences of economic activity. Thus, for example, the thesis maintains that economists believe that market liberalising policies will improve an economy’s capacity to deliver greater material wealth, but are not in the slightest concerned that those same policies impact adversely on job security. Moreover, so the argument goes, economists have no interest, or expertise, in distributional or environmental issues. An implication of this thesis is that the detractors of economists are motivated by a better balanced consideration of all of the various factors that contribute to, or subtract from, human happiness. Those of you who have undertaken some formal study of economics at tertiary level will know that this thesis betrays an ignorance of economics. But it may, nevertheless, reflect a keen observation of economists. Jacob Viner is reputed to have said that ‘economics is what economists do’. Irrespective of whether you agree with that statement, I would ask you to accept that economics is not what most people think economists do. This proposes a challenge for economists around the world, but perhaps especially in Australia, given the intensity of the largely misguided (and most assuredly misinformed) criticism of ‘economic rationalism’ in this country. In the interests of a more honest debate, I will make just a few points today. Adam Smith’s Wealth of Nations can be seen as an attempt to lay the foundations for the argument that liberal markets act to enhance material wealth, the secondary leg of support. The heroic utilitarian tradition and the more recent neoclassical economics have built on this foundation. The widespread application of neoclassical principles by contemporary economists may go some way to explaining why there is an equally widespread view today that economists are interested only in the material. Indeed, it is easy to understand why an astute observer of the public behaviour of economists could very probably be entirely ignorant of the primary support for liberal economics. Yet not all economists have lost sight of the ‘old heritage’. David Henderson, for example, writes that ‘a liberal is...one who emphasises the value of individual freedom, and who therefore judges measures and policies, economic as well as political, primarily with reference to their effects on freedom. Economic liberalism favours policies that promote and enlarge economic freedom, both for their own sake and because they make for greater prosperity’. I suspect that, if put to the test, all liberal market economists would share this view. The fact that they spend so much of their time arguing the material (GDP) benefits of liberal markets does not mean that their support for market liberalising policies betrays a concern for the material to the exclusion of the substantive. Indeed, most liberal market economists would have little difficulty agreeing with Sen’s emphasis on the substantive freedoms of political and civil liberty, social inclusion, literacy and economic security, as ‘constituent components’ of development. Moreover, they would likely agree that the regulation of markets to prevent two people’s engaging voluntarily in commercial exchange is as indefensible in principle as legislating to prevent those same two people’s sharing a conversation, a public bar, a classroom, a house or a family. My second point today is that even the most liberal of economists recognises that markets may fail. And many economists working in the public sector, in particular, are involved in finding solutions to such things, including in environmental economics, health economics and (perhaps more controversially) education and innovation policy. Third, the detractors of economists make no less of an appeal to the material consequences of their policy prescriptions. Their complaint is not that economists are preoccupied with materialism, but rather that liberal markets do not contribute to advances in human income and wealth. They disagree fundamentally with Sen’s statement of the secondary leg of support for liberal markets, ‘that markets typically work to expand income and wealth and economic opportunities’. They disagree also with Ross Gittins’ description of economists as ‘experts on how communities can make themselves richer, have higher incomes so they can afford to consume more goods and services each year’. Instead, our detractors believe that nationalistic, paternalistic and protectionist policies offer better prospects of increases in material standards of living. Fourth, there is absolutely no respectable evidence that market liberalising policies reduce economic security, not even job security. Certainly, liberalising reforms may produce transitional adjustment costs, including temporary insecurity for those adversely affected by the reform; and indeed, in the absence of compensation, some may well be adversely affected permanently. But there is simply no compelling evidence that liberal policy regimes are associated with less economic security for societies in general. Indeed, on any reasonable interpretation of the concept of economic security, the converse is the case. Just what would our detractors say of the economic security of a peasant farmer in sub-Saharan Africa denied an income by the anti-liberal, regulated, protectionist agricultural trading regimes of much of the developed world? Don’t blame liberal market economists for this particular tragedy. And don’t blame them either for the fact that the annual value of agricultural subsidies paid by taxpayers in the developed world to their farmers is five times what those same taxpayers are prepared to distribute in aid to the developing world. Fifth, as in many other areas of social science, the economic debate is prone to its being hijacked by people with opaque agenda. There is no better illustration of this than the work of the United Nations Development Program (UNDP) on globalisation and poverty. On this topic, I urge you to read the article in the most recent (centenary) edition of the Treasury Economic Roundup, and the paper by Ian Castles on the UN Human Development Report 1999 cited in the bibliography to that article. Treasury is in the midst of a substantial program of work on globalisation and poverty issues, including in the fora of the recently established G20, of which Australia is an active member. And finally, don’t assume that because the last two decades of the last century were characterised, generally, by market liberalising reforms there is something inexorable about the direction of economic policy change. Liberal market economics is under attack, and not just in the streets. The critics must be answered. And in that task, all of you have an important role to play. Can I ask you to heed the urging of one of my predecessors, John Stone, and ‘point out trenchantly that the charlatans (we could hardly call them emperors) have no clothes’? 5 - Lawrence A Boland, The Foundations of Economic Method, London, George Allen and Unwin, 1982. 6 - Without wanting to buy into the debate on what defines ‘economic rationalism’, I would be comfortable with this term’s being used, for present purposes, interchangeably with the more conventional ‘liberal market economics’. 7 - J.R. Hicks, Wealth and Welfare, Oxford, Basil Blackwell, 1981, p.138; cited in Amartya Sen, Development as Freedom, Oxford, Oxford University Press, 1999, p.28. 9 - He goes on to say that: ‘a denial of opportunities of transaction, through arbitrary controls, can be a source of unfreedom in itself. People are then prevented from doing what can be taken to be ¾ in the absence of compelling reasons to the contrary; something that is within their right to do. This point does not depend on the efficiency of the market mechanism or on any extensive analysis of the consequences of having or not having a market system; it turns simply on the importance of freedom of exchange and transaction without let or hindrance. This argument for the market has to be distinguished from a second argument, which is very popular right now: that markets typically work to expand income and wealth and economic opportunities that people have. Arbitrary restrictions of the market mechanism can lead to a reduction of freedoms because of the consequential effects of the absence of markets. Deprivations can result when people are denied the economic opportunities and favourable consequences that markets offer and support.’ Sen, op. cit. pp. 26-27. 10 - This tradition scales lofty heights in establishing the so-called ‘first fundamental theorem of welfare economics’, according to which, in the absence of externalities and other instances of market failure, a competitive general equilibrium is Pareto efficient, in the sense that nobody can be made better off (materially, of course) without at least one other person being made worse off. 11 - David Henderson, ‘Anti-liberalism 2000’, Wincott Lecture, London, 12 October 2000, available from the Institute of Economic Affairs website: http://www.iea.org.uk/. 12 - Sen, op. cit. p. 26. 13 - Gittins, op. cit. 15 - Treasury, ‘Global poverty and inequality in the 20th century: turning the corner?’, Economic Roundup, Centenary Edition, 2001; available on the Treasury website at: http://www.treasury.gov.au. 16 - John Stone, Australian Financial Review, 16 May 2001. Rudd gets serious about homelessness. Declaring that he doesn’t want to be Prime Minister “just for the sake of it” Kevin Rudd has ordered an inquiry into homelessness and demanded the draft report by May. “It’s dead wrong that in a country as wealthy as ours, we have 100,000 people who are classified as homeless,” the Prime Minister said after meeting members of the Choir of Hard Knocks at Parliament House. “It’s not just a question of saying, here’s a building, put all the homeless people in it. It doesn’t work that way. I’m not interested in being the Prime Minister of Australia for the sake of being here. Frankly, I’m just not. I want to make a difference and this is one area where we as a nation can make a difference if we get it right. The Opposition Leader Brendan Nelson offered the Prime Minister his full support. “I commit the alternative government of Australia to do everything that we can to work with the development of the White Paper,” he said. “We have got to make sure that there shouldn’t be any person in Australia that’s homeless without all of the support that could be given and unfortunately about a third of those people are suffering from mental illness”. Mr Rudd has asked the executive director of the Brotherhood of St Laurence Tony Nicholson to prepare what will be his government’s first White Paper. The draft report will be due in May, and the final report by August. Mr Nicholson told the Canberra Times that the timetable was tight and that he wasn’t going to waste time re-reporting what was known. Mr Rudd had handed him a unique opportunity to help make inroads into the problem. “I have working in this field for over 25 years and this is the first time that we have had such a commitment from a Prime Minister,” he said. Mr Nicholson said he wanted the 1,300 or more community organisations that deliver services to tell him what worked and what needed to be changed. He wanted to see which successful local programs could be taken national. The director of ACT Shelter Jeffrey Dalton said the Territory had several ideas to offer. One was the draft Charter of Rights for homeless people currently under consideration by the ACT government. A lot could be also done with Centrelink whose procedures can trigger homelessness. When it stops payments to clients it can inadvertently stop their rent, which is often automatically deducted from their payments. Sunday dollars+sense: Good at picking stocks. Not. Had a bad week on the share market? I’ve words of reassurance. Even the experts do badly. Most of them worse that what you would do if you picked stocks using a dartboard. The last two financial years were actually quite good ones for the experts who run our super funds. SuperRatings says they made 15 per cent and 16 per cent. That’s right. The experts who we pay to pick stocks for us would have done better had they done nothing and just held on to the stocks in the index. It’s not just that they sometimes select the wrong stocks, it’s that they chop and change (showing off their expertise) at the wrong time. In the American Economic Review last year Ilia Dichev of the University of Michigan compared the returns that investors had actually received buying and selling stocks to those they would have received if they hung on to those stocks all along. In 18 of the 19 worldwide stock markets examined the investors had done worse by buying and selling. In Australia in the two decades to 2004 the typical stock grew in value by 12.3 per cent a year. But the amount actually made by Australians buying and selling stocks in those two decades was only 11.7 per cent a year. Economist Andrew Leigh from the Australian National University says we make the same sort of mistakes when we decide to switch queues at the supermarket. We would usually be better off staying put. Occasionally we will switch to the right queue. Occasionally when I toss a coin and bet on ‘heads’ it comes up. But an important finding from other research is that those few funds managers who do do well in any period of time (there will always be some) tend to do badly in the next period of time. ‘Heads’ doesn’t keep coming up. Why is picking stocks and picking and working out when to buy and sell them almost impossible? For the same reason that picking queues in the supermarket is almost impossible. Other people will have already picked the good queue before us slowing it down. The price of one stock already incorporates everything that’s known about its future. So does the price of the next stock. So there’s little point in switching, unless you fancy yourself as someone with superior insight, or a super fund manager. Just when it looked as if everything that could go wrong had gone wrong this week along came a rogue trader who cost Societe General more than $8 billion – the biggest loss in banking history. It was that sort of week. By Tuesday the worldwide share rout had cut 23 per cent off the value of Australian shares from their November peak. It didn’t seem to matter that many of the companies whose shares were being sold were extraordinarily profitable or that Australians were handing money to them hand over fist. The inflation data released on Wednesday showed that the price charged for clothing had actually increased in the three months to December despite movements in the dollar making clothes much cheaper to import. In just the last twelve months Australians have bought more than one million new cars (1,050,000 according to the figures released on Thursday) and a hard-to-credit nine million mobile phones. They are extraordinary totals for a nation of 21 million people – totals that make Wednesday’s sharp jump in inflation look unsurprising (and make the Coalition’s election slogan ‘Go for Growth’ look plain silly). The recklessness with which we’ve been spending our money has pushed our inflation rate to a 16-year high –well beyond the Reserve Bank’s target band - and seems set to push it higher. Chris Richardson of Access Economics said this week the figures were “ugly” and that the Reserve Bank would have no choice but to push up interest rates – for the third time in six months – to bring them down. But the Reserve Bank board always has a choice and right now it is probably glad that it doesn’t have to make a decision until its next scheduled meeting, due in ten days time. As things were looking at the start of the week it probably wouldn’t have hiked: Australian and world stock markets were in free-fall, in our case for the twelfth consecutive day. The global freefall matters for rates because it could be signaling a worldwide economic downturn, which would pretty quickly cut the amount of money Australians have to spend. The Australian freefall matters because it is making Australians less wealthy. Someone whose wealth has been cut by 10 to 20 per cent is likely to spend less. And as even high-flyers like the man who last year organised a takeover bid for Qantas, David Coe this week, a falling share market can rob you of your money instantly. Like many Australians he had borrowed heavily to buy shares. When the share price of his company Allco Finance started to tank his lenders demanded an instant top up of his collateral. The only way he could raise the cash was to sell many of the shares, pushing their price down further still. It’s a scene that’s been repeated over and over again this week. Toward the end of each day thousands of Australians have been receiving phone calls or text messages demanding that they top up their collateral. Those people are likely to be suddenly less free to splash around their cash. Their enforced sudden restraint is likely to do much - perhaps all, perhaps too much - of the Reserve Bank’s work for it. Or that’s how it seemed on Tuesday. By Wednesday when the full ugliness of the inflation figures had become apparent it seemed as if the Reserve Bank would have to step in. And it almost certainly will have to. But when. One argument is that it doesn’t have to be at its first board meeting in 2008. The Bank is charged with controlling inflation in the medium-term, not immediately. It has always had the discretion to exercise judgment in taking its decisions. That’s why it makes them rather than some sort of machine following an automatic rule. Its board minutes show that it believed rates needed to be hiked in September but held off because of concern about a “protracted credit crisis around the world” which it felt would cut global economic growth by 2 percentage points and Australian non-farm economic growth by 1.5 percentage points. It’s possible to argue that that has just happened and at least until the extent of the damage becomes clear it should do nothing. The counter argument is that if it waits for another month and then another month it will have done nothing. If it thinks it will need to push up rates, it may as well do it. The previous Reserve Bank Governor Ian Macfarlane described his decision-making process at these moments this way in an interview with the ABC’s Maxine McKew shortly after he left the job. What would be the biggest mistake right now? Its hard to say, but by the end of the week raising looked less risky than it had. The Australian share market bounced back 4 per cent on Wednesday, 3 per cent on Thursday and 5 per cent on Friday, undoing a fair chunk of its 23 per cent slide. And on Friday came news from China that its economy was still growing very strongly - by 11.4 per cent throughout 2007. While its export income was decelerating, spending by its own citizens was accelerating. It looked as if it would be bidding up the price of Australian iron, coal and gas for some time to come. The Australian government is doubtless happy to leave these dilemmas to the Bank. It means The Bank will get blamed for whatever it does rather than our elected leaders. Head of Australia's only completely new government department - Climate Change. The head of Australia’s only completely new government department says it’s a great honour. But he’s not talking about the Public Service Medal he’ll receive today for his earlier work as Deputy Secretary to the Treasury and head of the secretariat for the Prime Minister’s Task Group on Emissions Trading. Martin Parkinson is talking about the opportunity to run the new Department of Climate Change set up within the Prime Minister’s portfolio within days of the election. Within weeks he hopes they will all be together in part of what used to be the Tax Office headquarters in Constitution Avenue Civic. “We are waiting for the office fit out. Accommodation is so tight in Canberra right now that you go into a queue and wait until somebody can actually begin to do the work,” he said yesterday. The Department of Climate Change has been given until the end of this year to finalise the design of the system of emissions trading that Kevin Rudd has promised to introduce in 2010. It’s work that Dr Parkinson feels he hasn’t stopped doing since December 2006. That’s when John Howard plucked him from the Deputy Secretary’s position in Treasury and asked him to run the Secretariat for the his Task Group on Emissions Trading, the first sign that the Prime Minister was softening in what been his hard-line opposition to any form of carbon tax. By the time the Task Group had reported in May his mood and broader public opinion had swung behind a system of emissions trading and he appointed Martin Parkinson to work on implementing the report as head of the Climate Change Group within his Department. On the election of the Labor government he was made head of the new Department of Climate Change within the Prime Minister’s portfolio and given one of the most impressive of the new ministers, Penny Wong. Within days he was in Bali with Kevin Rudd, Penny Wong, Peter Garrett and Wayne Swan. When asked whether introducing a system of emissions trading would be a bigger reform than the new tax system introduced by the previous government in 2000, Martin Parkinson goes back further. 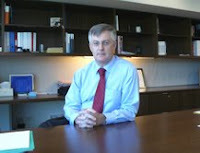 Dr Parkinson said he expected to put options to the Prime Minister within months. Made a Member of the Order of Australia today. As a practitioner of the craft of economic journalism (which is essentially explaining economic issues in simple and engaging terms) he is first class. He is unique when it comes to the even-more important job of nurturing economic journalists. Ross is a prescient fellow as well. Below the fold is a talk he gave to Australian Business Economists before last year's election pretty well setting out how things would happen. One reason I’m invited to speak on the political and economic outlook each year is that I can’t do so without making some political predictions and, since I normally leave the economic forecasting to business economists, this is their chance to get their own back and have a laugh at my expense when, inevitably, some of my predictions prove badly astray. This year you’ve really set me up, holding your forecasting conference just 10 days before a very heavily contested federal election campaign. But, like a good journalist with an eye to a good read, I’m going to lead with my chin and take my chances. I confidently predict Kevin Rudd will win comfortably and we’ll see a change of government. I don’t believe Labor’s win will be narrow. Hesitant people are always predicting elections that ‘go down to the wire’ but, actually, such close calls are not common. Landslides are more common. Nor do I believe in trying to predict the outcomes of elections by counting the particular seats likely to be won or lost. There’s an old saying that, if the swing is on, it’s on. If the swing is on, the necessary seats will come - but not necessarily those the Mackerras pendulum says should come. It’s like being asked where the jobs will come from in a recovery. When you’ve been around for a while, you learn not to make detailed predictions, just to be confident they’ll come from somewhere. I always reply, ask me again in a few years time and I’ll look up the figures for you. Almost everything that follows will be based on the assumption of a Labor win. That’s mainly because pondering what life would be like under a Rudd government is the more interesting and potentially useful thing I could do. Life under a re-elected Liberal government - possibly without John Howard - would be little changed. Peter Costello’s accession to the leadership - either immediately or after a year or so - is undoubted. His two main rivals - Tony Abbott and Malcolm Turnbull - have both had most unimpressive campaigns. Even so, Costello will survive one term at best. His chances of ever making it back into government are zilch. Being out of office in every state and territory as well as federally will leave the Libs in a terribly weakened and demoralised state, susceptible to much infighting. It will take them years to recover. Business will swing all its focus onto trying to influence and ingratiate itself with the Rudd government. Even so, the election of a Labor government at the federal level is the necessarily first step towards breaking Labor’s stranglehold at the state level. The Australian voters’ penchant for having an each-way bet at the federal and state levels is a potent force. The election of a few Liberal state governments will be a most healthy development and I look forward to the day, sorry only that it didn’t start last March with the defeat of the Iemma government. If I’m right in predicting a Rudd win, the central question is why Howard was defeated at time when the economy was positively booming. It’s true that - leaving aside the Left’s regiment of Howard Haters - the public has not developed a dislike of Howard comparable to its loathing of Gough Whitlam or Paul Keating. I think it’s mainly the It’s Time factor. Howard is looking old and wizened - televising his morning walks doesn’t do him any favours - whereas Rudd is young, good looking, obviously intelligent, well-spoken and capable of behaving with dignity on public occasions with presidents and the Queen. Equally importantly, unlike Howard - whose voice and visage we’ve grown tired of after his three decades in public life - Rudd has no track record. No list of broken promises to his name. It’s important to understand that the flip side of cynicism is naivety and the electorate regularly flip-flops from one to the other. In short, Rudd’s new face makes him someone in whom hope can spring eternal. This election campaign is about personalities, not policies. Rudd keeps saying he stands for ‘fresh ideas’. What is the fresh idea? It’s Kevin Rudd. He’s sold himself as a younger John Howard and that’s what the public has been happy to buy. Rudd represents a change (which is nice) without change (which isn’t). So the electorate’s switch from Howard to Rudd is the ultimate act of consumerism: we’ve simply traded Howard in on the new model. But I don’t think it’s quite as superficial as that. I think Howard has suffered a significant erosion of his credibility in the eyes of the electorate. With his non-core promises, his weapons of mass destruction, his children overboard, his Tampa, his mistreatment of David Hicks, his AWB scandal and his promise to keep interest rates at record lows, he’s led us up the garden path one too many times. Every time Howard got caught misleading us, his minders would assure the press gallery that the public didn’t really care. Case by case, that was true. But after 11 years of misbehaviour, all those cases leave a cumulative distaste in the electorate’s mouth. At the time of the sudden discovery of an Aboriginal national emergency in the Northern Territory, I was struck when I heard John Laws ask his listeners whether this was Howard ‘doing a Tampa’. I’m sure that, at the time of the Tampa, neither Laws nor any of his listeners thought Howard was merely pulling on a stunt to help him win an election. At this remove, however, Laws was sure his listeners would know that ‘doing a Tampa’ meant. With Howard’s loss of credibility, the public stopped listening to him, just as they stopped listen to Keating in 1996. The other point to make in explaining the switch to Rudd is that one policy really did affect a lot of votes: Work Choices. It worries workers who perceive themselves to have little personal bargaining power and others who worry their children may be adversely affected. There’s circumstantial support for this proposition in the big swings to Labor among young people and women. In any case, Howard tacitly acknowledged Work Choices was hurting electorally with his major watering down of the policy and reintroduction of a fairness test, the attempt to abandon the name Work Choices and the huge advertising campaign. But this backdown has come too late to register on the public’s consciousness. I’ll bet Howard lies awake a night wishing he’d never touched Work Choices. One of the most widely remarked features of this campaign is the way Rudd has said ‘me too’ to so many of the Government’s policies. But though this may be the most extreme example we’ve seen, it’s by no means the first. As you recall, Howard tried to make himself a ‘small target’ when he beat Keating in 1996. He promised ‘never ever’ to introduce a GST, abandoned a lifetime of opposition to Medicare and played down any plans he had to reform industrial relations. Me tooism is a strategy that appeals to oppositions. In any argument over policy, government’s have an inbuilt advantage because they enjoy the authority of office. It’s the government that’s best able to introduce policies it hopes will ‘wedge’ its opponents, dividing them internally. Howard wedged Labor so successfully over the years that it has learnt to protect itself by instantaneously agreeing to every policy Howard proposes. But me tooism is best seen as one way of competing, with clues to what’s happening coming from Hotelling’s law. Labor has sought to make its product indistinguishable from the Liberals’ in areas where the Libs are perceived by voters to be more capable (such as the economy, defence and security), but sought to differentiate its product in areas where Labor’s perceived to be more capable (education, health, the environment and industrial relations). So Labor has not said me too in these areas, but has sought to focus the election debate upon them. But me too is a game for both sides. Consider all the respects in which Howard sought to narrow the gap with Labor because he was fighting on Labor territory and wanted to shift debate back to his own territory: he has heavily modified Work Choices by restoring a safety-net, completely reversed his scepticism on climate change and opposition to an emissions trading scheme, suddenly discovered a belief in symbolic reconciliation, gone cold on nuclear power and stumped up big bucks for water, tertiary education, hospitals and child care. What kind of a man is Rudd? Australian election campaigns have become more presidential and so have the day-to-day operations of government - that is, more centred on the personality and preferences of the prime minister. That’s been true of Howard; it will be truer of Rudd. The Libs have always been a leader-calls-the-shots party, whereas Labor has been more democratic, with caucus having the final say. Rudd seems more self-willed in the style of a Liberal prime minister, as revealed by his unilateral announcement that he, not caucus, will decide who gets into cabinet. The question is whether, once Labor is safely back into government, the rest of the parliamentary party is still willing to stifle their differing preferences in the way they have been in their efforts to defeat the cleverest politician of our age, John Howard. My guess is they won’t be, and that Rudd will face a fair bit of internal dissent. With all of Rudd’s me tooing, there is a suspicion in many people’s minds that, once he’s installed, he’ll be revealed to be something other than he presented himself as before the election. Liberal supporters fear he’ll reveal himself as a closet socialist; Labor supporters hope he’ll reveal himself as any kind of socialist. I suspect both sides will be surprised - that, with Rudd, what you see is what you get. He really is just the younger version of John Howard he’s portrayed himself as. I believe he’s a very conservative man, with views on foreign affairs, defence, national security and terrorism that are little distinguishable from Howard’s (even on Iraq), and views on economic issues that aren’t far from Howard’s, either. Despite the Libs laughable attempt to portray him as a tool of the union movement (like Bob Hawke was, d’ya mean?) and imaginary claim that he would return us to centralised wage-fixing, the changes he’ll make to the now heavily modified Work Choices are quite cautious. I suspect Rudd is big on tactics, but weak on strategy. You can see that in his decision to adopt 90 per cent of Howard’s tax cuts. As a political tactic, this was smart: he knew the Libs’ advantage on taxation meant he couldn’t win a comparison of rival tax cuts, so by matching the Libs he removed taxation as an election issue. As a strategy, however, it left much to be desired. He claimed that the hugely expensive areas education and health were his highest priorities but, at the first opportunity to spend $31 billion on cutting tax rather than fixing education and health, he seized it. Nor was he prepared to use a refusal to match Howard’s tax cut to demonstrate his superior credentials as an economic manager and economic conservative. Rudd is highly ambitious and I suspect his ambition outweighs his commitment to Labor values. If so, he’ll be good at winning elections, but not at knowing why he wants to win apart from the obvious. He’ll survive for a long time, but achieve surprisingly little. He’s not a class warrior nor highly ideological, but he is a control freak, who looks set to expand the role of his own department. He’s self-willed, a tough boss, a hard worker and a detail-man. This is not a good election to win. The longstanding pattern is for federal governments to be tossed out only after they’ve presided over a recession. That’s true of the Whitlam, Fraser and Hawke/Keating governments. But the Howard government will be the exception to the rule: it presided over 11 years of strong economic growth, low inflation and falling unemployment, all the time grinding into the public’s consciousness its claim that Labor was a hopeless economic manager. The Rudd government is unlikely to be as lucky as the Howard government. With the expansion phase now in its 17th year, the chances of recession occurring some time in the next three years would have to be high. And in the meantime, of course, the Reserve will be grappling with a runaway economy, possibly raising rates a fair bit further. So there’s a fair chance the Howard government will go down in history as an exemplary economic manager, whereas Labor’s reputation as hopeless economic manager will be confirmed for a generation. Added to this we have a government that said me too to pretty much all of the Howard government’s now clearly inappropriate three years of tax cuts and general spending spree. It’s standard practice for incoming governments to use their first budget to change the direction of their pre-election rhetoric and also clean out a lot of the favourite spending programs of their predecessors. Labor has announced spending cuts it says are worth $3 billion and also made noises about establishing a razor gang. The press gallery has treated these announcements with scepticism; if it knew a bit more economic history it wouldn’t. I think that when economists look back on the economic record of the Howard government they’ll conclude it had such good luck it didn’t have to try very hard and, in fact, didn’t try very hard. They spent so long telling us what good managers they were they came to believe their own bulldust. Paradoxically, Labor’s reputation as a hopeless economic manager means it knows it must always try hard on economic policy if it wants to survive in government. Similarly, when you’re a Liberal you can afford to take the business community for granted, but when you’re Labor you always have something to prove. Rudd Labor will be seeking legitimacy and will try hard to establish good relations with business. Labor is likely to listen more closely to Treasury, and Treasury stands a good chance of giving Rudd and Wayne Swan something to believe in and fight for, just as it did Keating. Between Treasury and Professor Ross Garnaut, I expect Labor’s implementation of the tradable emissions regime to be quite sensibly done. It wouldn’t be realistic to expect a Rudd government to be as committed to micro reform as Treasurer Keating was - the days of continuous reform are gone - but I do think there’s a good change it will be more interested in reform than the Howard government was. Labor will not, of course, have control of the Senate. But nor are the Libs likely to retain control - certainly not after the new senators take their places in July. The balance of power is likely to be held by the Greens, which raises a novel circumstance. In the past, having the Australian Democrats holding the balance of power acted as a brake on Labor implementing some of its more radical policies, probably no bad thing. But now with the Greens in may be that Labor has to make some of its policies more radical to get them through. Over the past couple of years the Reserve Bank has developed a clear modus operandi in which it waits for the quarterly CPI release, revises its inflation forecast on the basis of the new information and then adjusts the stance of policy if necessary at the board meeting about two weeks later. This says rates are most likely to be adjusted at the February, May, August and November meetings. This established MO has many attractions for the Reserve. For a start, the timing of the quarterly Statement on Monetary Policy has been adjusted to come soon after those board meetings and also come shortly before the half-yearly appearances before the parliamentary committee. This means that, whether or not the board decides to move, only a few days pass before the Reserve is able to provide a highly detailed exposition of its reasoning. A late draft of the SoMP would be available at the time of the meeting. It’s always difficult for central bankers to make a detailed public statement - or worse, be subjected to detailed public questioning by their parliamentary masters - when the case for a rate change has become apparent, but before they’ve had a chance to put it into effect. They always want to be in a position to assert that, in present circumstances, the current policy setting is ‘about right’. So the beauty of this alignment of meeting, SoMP and hearing is that it maximises the chance of the central bankers been able to report publicly after they’ve acted, not before. Another advantage of this MO is that it focuses attention on inflation and the prospects for inflation. Rate rises are never popular, but neither is inflation, and this alignment - acting so soon after the release of the CPI - highlights the Reserve’s justification for its unpopular action. When you’re trying to control inflation expectations, it’s important to keep reminding the public that you’re obsessive about controlling actual inflation and about achieving your target. But it’s worth remembering - as we were reminded by Glenn Stevens’s statement last week - that while inflation is the end result we’re worried about, it’s excessive growth that’s the cause of the result, so it’s growth that interest rates work on to get to the result. A simple point, but one the politicians were happy to dissemble in the election campaign, with their eulogising of growth in one breath and their pious expressions of concern about inflation in the next. A further advantage of this MO is that it makes it easier for the financial markets and business economists to form more accurate expectations about future rate movements. It’s a very clear signalling device. The Reserve has nothing to gain and a little to lose by catching the markets out. The downside of catching the market with its rates down is that it makes embarrassed economists more likely to want to cover their embarrassment by arguing that the rate rise is unjustified. It’s a mistake to imagine that being an independent central banks means you can do as you please. In a democracy, no public institution can do as it pleases. If it becomes too unpopular, eventually it will have its wings clipped. The consequence is that independent central banks have to do their own worrying about politics. And one consequence of this is that, when you’re doing unpopular things like raising rates, it helps to have a chorus of market and business experts calling for and predicting a rate rise, thereby giving the rise an air of legitimacy as well as softening people up. Finally, when you’re tightening rates in a heavily indebted economy, this MO allows you to proceed cautiously, responding to the flow of incoming evidence as you go ever higher - something that’s important if you believe, as most central bankers seem to, that rate rises aren’t linear. That eventually you hit a point where the penny drops and behaviour really starts to change. But there are a couple of qualifications to be made to this happy story. First, making one potential move a quarter is fine provided it allows you to move fast enough. It may not. As you know, the Reserve probably would have tighten at its September meeting after seeing the June quarter national accounts, had it not been for the sub-prime turmoil. Second, this as an MO for a tightening cycle. It doesn’t make as much sense for an easing cycle - rate cuts are never unpopular - and, particularly if you thought the economy was slowing sharply, you might want to move a lot faster than once a quarter. The moral of the story is that, no matter how entrenched the quarterly MO becomes, the Reserve with always reserve the right to make changes in other months if it judges that to be necessary. Were that to happen and were you to be caught out, there’d be no point feeling aggrieved and claiming the bank had broken an unwritten convention. This MO will last only as long as it suits the Reserve. Looking to next year, some economists think they can see two, even three more rate rises coming. They may prove right but, if you’re in this camp, just remember that you’re making a pure forecast. That is, you’re getting ahead of the game. The Reserve has no game plan that calls for two or three more rises. While it clearly has a bias to tighten, it will take things a month at a time, responding to the data as it rolls in. That data includes the national accounts and the labour price index, not just the CPI, of course. Remember, too, that the need for further rises in the cash rate will be affected by the likelihood of the major banks instituting a mortgage rate rise of their own and by the possibility of a further slowing in the world economy, particularly the Asian end of it. Tax breaks set to top 60 billion! A rather depressing update to this story I wrote only a year ago. The Commonwealth Treasury has warned that government spending on tax breaks is set to top $60 billion> unless it reins them in. The projections, contained in the Treasury’s Tax Expenditures Statement released late yesterday show that the cost of tax breaks is on track to jump from an estimated $51 billion this financial year to more than $61 billion by 2010-11. By then the Australian Government will be giving away one dollar in tax concessions for every four that it actually collects. ...which are projected to climb rapidly from $26.8 billion to $31.8 billion over the next three years. Driving the growth will be the action of the last government in making all superannuation payouts tax free to all Australians aged 60 and over from July last year. The most expensive of the superannuation tax concessions is the one that taxes contributions to funds and the earnings of funds at just 15 per cent instead of the taxpayer's marginal rate. The projections come as the ‘razor gang’ chaired by the Finance Minister Lindsay Tanner begins work on finding savings worth $5 billion to $15 billion ahead of the May Budget. In its statement the Treasury says that whereas direct government expenditures are annually “scrutinised by parliament, the media and the general public” tax expenditures are “generally not obvious” and are often examined only at the time they are introduced. The biggest identified by the Treasury outside of superannuation is 50 per cent tax exemption for income from capital gains introduced by the Coalition in 1999. By 2010-11 it is expected to cost $7.7 billion. The government could close many of these loopholes without breaking its election commitments. For instance, it has promised to retain the Private Health Insurance Rebate but it has not promised to tax it. Closing other loopholes would involve taking on groups to whom it has given no commitments. It could for instance save almost $1 billion by closing the tax exemption enjoyed by local government, something that the previous government attempted to do after it took office in 1996. Many of the tax breaks identified by the Treasury are attractive targets for Mr Tanner’s razor gang because they were introduced by the previous government and are either not means-tested or predominantly enjoyed by higher income Australians. The Treasurer Wayne Swan last night played down expectations that the tax expenditures would be targets of the razor saying they should be thought of as concessions that benefit taxpayers rather than revenue forgone. He stressed that the amount of money to be saved by removing each tax concession would generally be less that the Treasury’s estimate of its cost because when tax concessions were removed people tended to do less of the activity that became fully-taxed. Exclusive: Hew Griffiths to walk free tomorrow! Australia Day will be bitter-sweet for Hew Griffiths, an unemployed computer programmer from Berkeley Vale on the NSW Central Coast. 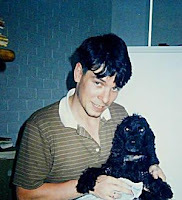 The 45-year old will walk free from the Ohio Correctional Centre tomorrow after six months in US jails as the first Australian and one of the first people in the world to be extradited to the US for the crime of illegally downloading software. Hew Griffiths was arrested at his father’s weatherboard house at 3.00am one morning in 2003 after being charged with violating the copyright laws of the United States. But the US government itself appealed and won in the Federal Court claiming that Australian residents did not need to have set foot in the US in order for it to have the right to extradite them there. Australia’s then Justice Minister Chris Ellison rejected pleas to intervene and in February last year two officials brandishing a one-way travel document bundled Griffiths on to a plane in what became propaganda victory for the US Department of Justice. But when Griffith arrived in the US the charges of illegal downloading were dropped (Griffiths’ computer only had a dial-up connection) and he pleaded guilty to a lesser charge of conspiracy to commit a copyright infringement. Described in the jail’s records as “white, male and 45” Griffiths is due to be released from the Ohio Correctional Centre tomorrow, on January 26. Including the three years he spent in Sydney’s Silverwater Correctional Centre fighting the extradition he will have spent four years behind bars. His elderly father Neil Griffiths is bitter about the timing of his son’s release. Without the funds to travel, he hasn’t seen his son since he was forcibly removed from Australia last February. Until Wednesday this week it looked as if Hew Griffiths might not be able to return to Australia at all. Because his family arrived in Australia as “ten pound pom” migrants in the 1970’s Hew Griffiths lacked both a passport and a reentry visa. His status as a permanent resident was automatically revoked when he was bustled out of Australia without those documents last year. His father feared that on release from the jail tomorrow he would be thrown into US immigration detention. On Wednesday the Australian Department of Immigration restored his permanent resident status and granted him a reentry visa after he successfully obtained a British passport. Neil Griffiths said yesterday that he was relieved his son was coming back but that he wouldn’t’ believe it until it happened. Using a computer that his father had bought to help with an adult education course Hew Griffiths joined and is said to have eventually helped run a global software cracking group entitled DrinkOrDie. His father said at the time of his arrest that he had been pleased that his son had been taking an interest in computers but that he had no idea of what he was doing. What's the Reserve Bank going to do? Don't doubt for second that the Reserve Bank is worried, deeply worried about yesterday's truly shocking inflation news. And not worried just because the rate is high – higher than it has been in 16 years – but also because this time the rate is trending up. You can get an idea about how quickly the inflation has snuck up on the Bank by going back to its inflation forecasts released in November. Then it was warning that underlying inflation would end the year at 3.25 per cent. In fact it has ended the year at close to 3.5 per cent and rising. But right now it finds itself in extraordinary circumstances. World stock markets have been in free-fall, and it is not yet certain that they've stopped. On-one seems to have a handle on what's happening to international financial markets or why. Until it gets a handle on what's happening the Bank would prefer not to pull hard on the only lever it has. Fortunately it has twelve days to wait for the smoke to clear. If the smoke does clear in time and it becomes apparent that markets are no longer at risk and the stuffing hasn't been knocked out of the Australian economy the Bank will push up rates. If there is still uncertainty – if, as now, no-one much has a clue what is going on - it will reluctantly wait. But only for as long as it needs to. As soon as the smoke does clear and as soon as its knows that the stuffing hasn't been knocked out of the Australian economy the Reserve Bank will act. We will face a rate rise unless we face something even worse first. And who's the blame? The Treasurer Wayne Swan says it's not him. He's right. But perhaps its not the other lot either. His opposite number Malcolm Turnbull said yesterday that inflation was the “inevitable consequence of a strong economy”. We've done it to ourselves by spending with such enthusiasm that retailers have felt little need to pass on the benefits they've been getting from the higher dollar. We haven't cared about cheap prices. As soon as the smoke clears, the Reserve Bank will make us care. The worst inflation result for 16 years dented Australia's share market recovery yesterday and added to pressure for an February interest rate rise. Australia's underlying rates of inflation – the ones watched by the Reserve Bank – surged to 3.4 and 3.8 per cent in the year to December, heights not seen since the last recession in 1991. But whereas in 1991 inflation was falling, it is now climbing into territory well beyond the Reserve Bank's 2 to 3 per cent target. 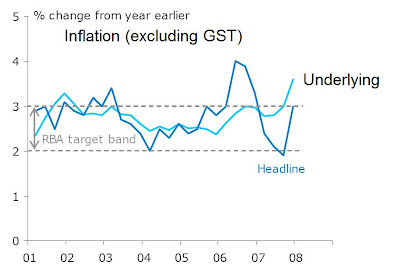 Noting that the former Treasurer Peter Costello had said mid-last year that “inflation is right where we want it” the new Treasurer Wayne Swan yesterday produced a graph to show that at that time the pressures were building. The Treasurer again committed himself to bring in a budget surplus of 1.5 per cent of GDP but stressed that this was a minimum commitment and that the actual surplus might be higher, subject to international economic developments. Mr Swan yesterday discussed the inflation outlook with both the head of his department Ken Henry and the Governor of the Reserve Bank Glenn Stevens and declared that while “nobody out there wants interest rate rises” the decision was one for the Bank to make by itself. Australia's quarterly rates of underlying inflation came in at 1.0 and 1.1 per cent, well above the Reserve Bank's trigger level of 0.7 per cent. The annual headline rate of inflation was 3.0 per cent, right at the top of the Bank's target zone. Canberra prices grew faster, growing by 3.3 per cent, a rate exceeded only in Brisbane. Among the Canberra prices to climb sharply were rents, up 7 per cent over the year; electricity charges up 18 per cent, water charges up 9 per cent and take away food up 5.7 per cent. Petrol prices grew strongly in the December quarter, climbing 7.3 per cent, roughly offsetting the effect of a fall in the price of fruit and vegetable prices of 10 per cent. The news reversed what had been a solid recovery in the Australian share market when it was released at 11.30am yesterday knocking 1 per cent of what had been a 6 per cent recovery in prices. The All Ordinaries index closed up 4.3 per cent or 224 points at 5,446 - its first gain after twelve straight days of losses. US shares steadied on Tuesday night after the Federal Reserve announced an emergency rate cut of 0.75 per and held out the prospect of more cuts to follow. Mr Swan said he welcomed the move and its initial beneficial impact on the Australian share market. But he said Asian growth would help Australia withstand the fallout from the US whatever happened. Opinion on financial markets is evenly divided about whether Australia's Reserve Bank will push interest rates in February or hold off because of the US crisis. The Bank is thought to be loathe to move amid financial turmoil, but Joshua Williamson of TD Securities said that not to act would be to risk more extreme action down the track. Note the alarming upward movement in the light blue line - the underlying rate - to a 16-year high. The "core" measures of inflation (those watched by the Reserve Bank) are 1.0 and 1.1 for the quarter; 3.8 and 3.4 per cent for the year. I'll be attending the Treasurer Wayne Swan's press conference. I think he'll bag the previous government. It is all very unhelpful, given what I wrote for this morning's paper. What's the Reserve Bank likely to do? Sit on its hands. Looking for a silver lining? There is one. Even if today’s inflation news is awful (and it almost certainly will be) the Reserve Bank is unlikely to push up interest rates. In normal circumstances if the inflation number due out this morning was bad the Reserve Bank board would push up interest rates almost automatically. The Bank’s trigger for a rate hike is 0.8 per cent. If the quarterly rate of underlying inflation comes in at 0.8 per cent or higher, the Bank takes it as a sign that the annual rate of inflation will soon be above 3 per cent and jacks up rates. If the quarterly rate is 0.7 per cent or below, it leaves rates put. Westpac and the ANZ are predicting a shocker of an inflation result today – an underlying inflation rate of 0.9 per cent for the quarter and 3.4 per cent for the year – well above the Reserve Bank’s 3 per cent ceiling for the first time. But the Bank’s board won’t react as it usually would when it meets on February 5. One is that this month Australia’s big private banks put up their rates independently of the Reserve, doing some of its work for it. It might want to wait and see what happens. The other is that the share market rout changes everything. In an immediate sense it is making well-off Australians poorer, especially those in deep pain who have borrowed to buy shares. That itself by itself will take pressure of inflation as they find themselves less able to spray around money. The other is that the rout could bring on a worldwide economic slowdown. Goldman Sachs yesterday downgraded its forecast for Australian growth this year from 3.5 per cent to 3 per cent. It cut its forecast for next year to 2.75 per cent. Malcolm Turnbull used to run Goldman Sachs in Australia. He is now the Opposition’s Treasury spokesman. He thinks that the rout is already hurting the economy. As he put it yesterday: “As every day goes by, the case for the Reserve Bank holding its hand and not raising rates becomes stronger”. The Bank is likely to agree with him and sit on those hands when it next meets, no matter how bad our rate of inflation. Panic selling wiped almost $100 billion off the value of Australian shares yesterday as Australian market suffered its biggest one-day loss in two decades, erasing all of the gains made over the last year. The 7.26 per cent collapse in the All Ordinaries index followed a collapse of 5.48 per cent in London, it’s biggest since the September 11 2001 terrorist attacks, and falls of 6.83 per cent in Paris and 7.16 per cent in Frankfurt. It was paced by falls of 5.65 per cent in Tokyo and 8.7 per cent in Hong Kong. The Australian market is down 23 per cent from its peak in November, a loss of $388 billion. It has lost all of its gains since October 2006. The website of Australia’s biggest on-line broker Commsec crashed for 20 minutes after the start of trade yesterday as an unprecedented number of customers attempted to get on line sell stocks. Commsec and other brokers were also busy demanding margin calls from customers who had borrowed to buy stocks and no longer had the security to justify their loans. The broker said it was using mobile phone messages to alert customers of the need to put in more cash. It was the 12th straight day of losses on the Australian share market – its longest losing streak since 1982. The ASX200 index slid 393.6 points to 5186.8; a collapse of 7.05 per cent. The All Ordinaries index fell 408.9 points to 5,222; its biggest one day loss since October 1987 and fourth-biggest on record. $96 billion was wiped off the value of the All Ordinaries index, taking the loss since the start of the year to $282 billion. Among the big losers were the ANZ bank which fell 7.06 per cent to $24.35, the National Australia Bank, which fell 6.53 per cent to $32.90, BHP Billiton which fell $2.29 to $31.00 and its takeover target Rio Tinto which slid 11.6 per cent, to $101.00. James Packer's Consolidated Media Holdings was one of the very few stocks to increase in value, closing 9.59 per cent higher, up 37 cents after news of a $3.31 billion joint-venture takeover offer from for the company from Lachlan Murdoch in co-operation with Mr Packer. The Treasurer Wayne Swan expressed confidence in the Australian market swaying he believed it was “well placed to ride out the turbulence that flows from events in the United States even though we are not immune from it”. However on the Futures Exchange, the March share price index contract slid a further 340 points, or 6.08 per cent, to 5,256 indicating that traders believe there are more losses ahead. The US billionaire investor George Soros was quoted as saying that the world was facing the worst financial crisis since World War II and that the US was threatened with recession. In an interview with an Austrian newspaper he said that the belief that financial market tended to balance was wrong and that the financial crisis was serious. In Australia the chief equities economist at Commsec Craig James said the fundamentals for the Australian economy have not changed. “Unemployment is near 33-year lows, the economy is growing at a firm clip of above 4 per cent and the budget is in surplus,” he said. The ACT economy has stalled, seized up. If you are looking for evidence drive south along the Kings Avenue Bridge to the St Marks National Theological Centre on the shores of Lake Burley Griffin. Its director Tom Frame wants to boost his student numbers by 5 per cent each year. He gets inquiries from all over the country. As part of Charles Sturt University he is offering a degree in theology that’s broad-based rather than conservative and evangelical. But he is unable to increase his on-campus enrolments at all. They are stalled, like the ACT economy. But not now. “Its actually cheaper to stay in Sydney and live in Newtown near the Moore Theological College, even though its fees are much more expensive,” he said. So concerned is Tom Frame that he has asked his university to consider building its own two-bedroom apartments in Barton to ensure that some of his students have somewhere to live. Otherwise he says St Marks might vanish. Canberra’s trend economic growth as measured by state final demand slowed to zero in the most recent quarter. Trend jobs growth in the past year is also near zero (slightly lower actually). That’s right. In trend terms there are no more ACT residents employed than there were a year ago. Not one. At the same time nationwide employment has soared by 258,000. The ACT has run out of new workers. It isn’t that employers don’t want people. The Bureau of Statistics says some 6,000 vacant jobs are going begging here right now, more than ever before. More than half of them are in the private sector. Chris Peters of the ACT & Region Chamber of Commerce says workers often come from interstate to start jobs, discover how hard it is to find somewhere to live here, and return home. The public service is attempting to get around the problem by including in some of its advertisements for senior jobs an assurance that although the position is based in Canberra the successful applicant “may choose to commute”. It’s no way to run a country. It’s as if we’ve put a “full-up” sign on the entrance to the nation’s capital. It should never have come to this, and if the ACT had a better opposition the government would have been held accountable. Canberra is surrounded by government-owned land already set aside for development. The government could have developed that land ahead of time before it was needed. Instead - until it got a move on last year - it waited as the price of land in the ACT climbed. The international consultancy Demographia this week published its analysis of housing costs in more than 200 English-speaking cities. It rated Canberra “severely unaffordable” along with New York, London and Los Angeles. We hit the big-time. It is often said in defence of Canberra’s high housing prices that our workers are paid more than the national average. (Demographia took this into account in its assessment of ACT housing prices and described them as severely unaffordable anyway.) But the other side of the coin is that our private sector workers get less than the national average, and our students much less. Bec Adams runs Anglicare’s ACT Housing Program. She says the rental market is now so tight that even Canberra residents earning the average income or more are unable to get houses to rent. Many landlords don’t like single parents and the problems they feel they bring, whatever their income. She adds that some are sympathetic, but in a over-tight rental market they can pick and choose on whatever criteria they want. Shared accommodation, once a traditional part of student life is hard to get and no longer affordable for some students. Instead many students and many workers are “couch surfing”, moving from house to house begging favours from their hosts. It’s not always pleasant, and it can put them at risk. “When you are couch-surfing you have no tenant rights,” Bec Adams says. “It’s really volatile, there’s often abuse. Young people sometimes feel like they need to do stuff to maintain housing, and sometimes that stuff is abusive to their physical and mental well-being”. Bec Adams is aware of sexual abuse and forced drug dealing as a result of couch-surfing. She says they are more common because there’s more couch-surfing. Once when Anglicare got people out of emergency housing they stayed out. Now many keep returning. Some have benefited from the ACT’s extreme housing shortage. Among them some existing home-owners. One of John Howard’s ministers once observed that “rising prices make for happy voters”. The ACT government itself has benefited. It gets more stamp duty when prices are high and stamp duty is an important source of income. Much of the boom in prices would have happened anyway. Prices have risen everywhere. But in no other state or territory have they risen so high as to stop new workers coming in to take up jobs. In no other state or territory are there more job vacancies than there are people looking for work able to fill them – roughly twice as many at the moment. Last year the Stanhope government belatedly indicated that it had learnt from its mistakes and acted quickly to release more land. In time things will improve. Canberra’s educational institutions and employers will eventually be able to function more normally. And Mr Tanner’s razor gang will help as well by cutting the demand for public servants. But it shouldn’t have come to this. A while back we were booming like Western Australia. We’ve stopped. Tuesday Column: Let's terrify our banks!